To explore how a play can be experienced in alternative media, Ipsos conducted a breakthroughs study on behalf of the Royal Shakespeare Theater. This led to testing audiences viewing the play Titus Andronicus, Shakespeare’s bloodiest and most violent work, live on stage, as a film in the cinema and as a virtual reality immersion. The goal was determine if viewing a play can be as engaging and emotionally evocative when viewed in other channels which have the potential to embrace a wider and potentially younger audience. To this end, viewers watched the play in the various formats and were measured for heartrate and emotional response using voice analytics. Elissa Moses will present the results of the study and how similar content performs on engagement and evoking emotion in the context of different delivery systems. 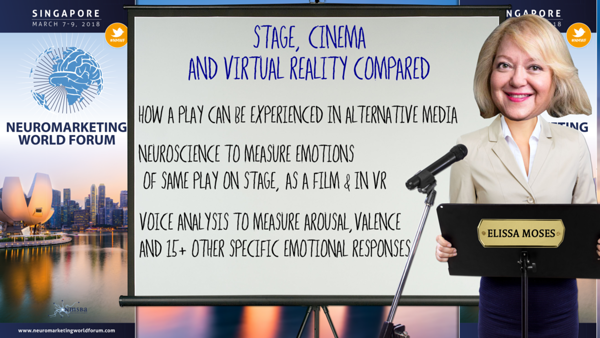 - Can entertainment such as a Shakespeare play be as evocative and emotionally arousing when experienced as virtual reality or watched as a film in a movie theater? - Does channel context have a significant impact on how content is experienced emotionally by the viewer?